Once you’ve been teaching a while, you may, like me, treat creating your course syllabus like laundry that’s waiting to be folded—something you know you must do but that you’d rather put off for as long as possible. We’ve been told for years that the primary function of a syllabus is to create a contract between student and instructor. However, looking at the syllabus as no more than a list of dos and don’ts and what’s due and when impedes us from using the time-honored document as a way to engender student buy-in. With a little retooling, the syllabus can be so much more, including a learning tool. Whether you post your syllabus on a course website or use a print version in a course packet, it’s worth looking at the syllabus with fresh eyes. The most fundamental goal of your syllabus is to make it reader-friendly. Use document design techniques to separate sections, such as the white space to avoid dense text; boldface to indicate important dates; italics to separate titles from body copy. At the top include pertinent course information: course name/time/location/section; your contact information including office location and hours; email; phone. Note your preferred way of communicating with students. Course objectives. Tell students what you want them to learn or what they will leave your class knowing. Also state your expectations. For example, will your course require many meetings with other students outside of class? Assignments and grading. Be clear about how grades are determined, and as you write the syllabus, don’t forget to be mindful of your own workload. It isn’t feasible to read 100 students’ journal entries three times a week, for example. Policies/procedures: Use your college’s boilerplate language about plagiarism, attendance, or the like. Mention add/drop dates. Schedule: List each class meeting and include the day’s topic, required reading, and due dates for assignments. Although you don’t want your syllabus to be so long and complex that students cannot readily see what is expected of them on any given day, don’t be afraid to go into some detail. You want to make sure that students can see a panoramic view of the course structure and how assignments link to course goals. A syllabus that helps foster student learning goes beyond the basics. 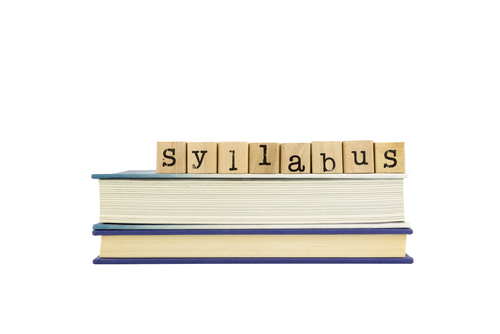 You can make your syllabus more meaningful by weaving the following elements throughout it. Make promises. Spell out the intellectual or social abilities the course will help students develop. Most instructors believe they are teaching their students valuable lessons; convey that belief in the syllabus by making promises about what they will take away. Orient the students. Include the schedule for the entire course so students can see its organizational structure and framework. Although it doing so is time intensive, a road map of the entire courses shows students where they have been and where they are at any given moment during the semester. Don’t be afraid to build in some flexibility, too. Make the syllabus an assignment. It is no secret that many students simply do not read the syllabus no matter how much time we put into creating it. Likewise, we have all had students ask us questions that are clearly spelled out on the syllabus. To avoid this annoying situation, consider giving a quiz on the syllabus at the beginning of the course. Another way to encourage students to read the syllabus is to have them map out their own learning objectives for the course based on what they see in the syllabus. You might even want to include an exercise in which you ask students to reflect on the assignments they look forward to and the ones they most dread. This motivates students to think about and to take responsibility for their own learning. Finally, make having the syllabus readily available part of the course requirements. Use it daily to point to important facets of your meticulously drawn document. Do you have any techniques that motivate students to read your syllabus? We’d love to hear from you! This is great, but perhaps we should work in a passing mention of course-management systems/platforms such as Moodle or Blackboard. Somehow when I read this, I thought of paper-based delivery. Remember we want to acknowledge that we’re in the 21st century. Or maybe it doesn’t matter here. After all, you are focusing strictly on the document, not its delivery or distribution. You choose. I’m just thinking aloud. This entry was posted in 2. Featured Articles and tagged creating syllabus, learning syllabus on July 28, 2015 by bizcombuzz.